New York City based portrait photographer Drew Gurian is a master at making just about anything work. Give him an assignment to shoot a celebrity in a tacky hotel room during a press junket, and he’ll have that room transformed into something workable within the hour. He’s an energetic problem-solver who works great under pressure and has the innate ability to capture people and moments that feel real and raw. That spirit runs throughout his entire body of work, and we were thrilled for the chance to work with Drew to subtly enhance and polish some of his photographs of actor Justin Bartha for a piece in The Observer. We work with a wide range of clients, all of whom have a unique set of expectations around post-production work. Some photographers like a highly-produced photo that looks ethereal and dreamlike. While others prefer subtler retouching that makes it hard to tell if the photo had even been tweaked or enhanced at all. A self-proclaimed traditionalist, Drew prefers his images to be as perfect in camera as possible before they even make it to the post-production stage. While he never wants his work to appear excessively retouched, he understands that a raw photo needs to be processed in some way to ensure a toned, refined feel. Our guiding rule when working on Drew’s photos was to be thorough and subtle in our efforts and help elevate the final result to make an already great photo look amazing. Although our goal was to be so nuanced that it would look like no retouching had been done at all, there was, of course, some basic back and forth and collaboration to help achieve the true cinematic feel Drew was going for in this portrait series of Justin Bartha. We made small enhancements here and there to tone and boost the photos, like blowing out a window a bit in the coyote picture, or accentuating the blue light on Justin’s face and hair in the close up portrait. That coyote, by the way, was property of the bar in which this shoot occurred. Drew knows a good prop when he sees one. In the End, Everyone Did What They Do Best. As a photographer, Drew wants to spend most of his time behind the camera. He’d rather take care of his business or work on mood boards for upcoming shoots, and less time sitting at his computer editing images. That’s where we came in – we left the photography to the photographer, and he left the post production work to the production strategists and retouchers. “Get people who are great at what they do, and let them do their own thing. Surround yourself with partners like pxl.house who are on top of their game,” said Gurian. Find us on Instagram at @pxl.house for more photos of our recent work. Contact us for estimates and inquiries for your project. What if something alive could be made still, then brought back to life again? Photographer Robb Long pondered this question when he reached out to PXL.HOUSE just a few weeks ago. Long produced a series of images for Fab Defense’s latest print ad campaign. The shots were of the Isreali-based gun manufacturer’s weaponry on a real person made to look like a toy soldier by coating the model in plasti-dip. The client, the agency (Epicosity), and Long were all pleased with the final results. But, what if the soldier could be brought back to life? After the ads launched, Long, Anthony Morrow, and the rest of the PXL.HOUSE team collaborated to push the creative even further. “I worked with Robb on a Buffalo Wild Wings campaign, and it was just a matter of time before we joined forces again,” said Morrow. Both creative teams hold an affinity for motion, spending their time messing around with video work, cinemagraphs and other methods of adding motion to otherwise still photography. Long turned the files of the soldier over to PXL.HOUSE, so that the PXL.HOUSE team could work their magic, making a still image move once again. As the Pennsylvania Ballet pirouetted into a new season, it turned to Eastern Standard, a Philadelphia-based agency, for assistance promoting its different ballets. When Chris Crisman—the photographer selected to shoot the assignment—became involved with the concept and pitch, everyone quickly got on board. Chris remained a key leader on the team, working directly with the Pennsylvania Ballet throughout the project. Crisman’s vision for utilizing the Philadelphia Museum of Art (PMA) as the backdrop for the dancer images solidified the concept. Chris’s connections were key in gaining agreement from the PMA and permission to photograph its interior spaces for the project. But that was just the beginning to the masterful work required to make these images happen. Upon approval of the project, Crisman partnered with PXL.HOUSE. Proactive planning and collaboration quickly ensued. The biggest challenge in photographing at the art museum is the inability to light the interior spaces or move any works of art. Exposure bracketing and gaining plenty of assets from which to work in post-production were key to a successful outcome. And Chris delivered on both. A few of the image concepts were up in the air, and PXL.HOUSE’s involvement resolved the connections required to make the images happen. For example, Crisman was out of town while the post-production work occurred on the Nutcracker image. The client wasn’t in love with the image. PXL.HOUSE stepped up with an idea of how to resolve the image that was spot on and gained client approval immediately. The project was truly a group effort. The eclectic wardrobe for this shoot included actual costumes used in the various live ballet performances coming this season. The ballerinas and performers were properly lit and photographed at an entirely different location. As a result, substantial editing took place, such as removing objects and backgrounds, as well as post-production compositing. Eastern Standard and Pennsylvania Ballet were both delightful and productive collaborators throughout the entire process. For people on aspirin therapy, the wear and tear on the stomach can be tough. In fact, stomach-related complaints are the common reasons why aspirin therapy is ceased. A local pharma company desired an unbranded campaign to educate the marketplace on the common issue mentioned above. Tom Browne, VP and Creative Director at greyhealth group, the agency working on the campaign, reached out to photographer Paul Pugliese once the client approved the concept of images including people with a burning stomach. Pugliese immediately turned to PXL.HOUSE for assistance on set in bringing the realistic depiction of a singed stomach to life, as well as the final retouching of all four images within the campaign. A few days prior to the shoot PXL.HOUSE spent time testing the visual effects of burning a few different materials, including cardboard, fabric and some other test materials. The fabric, although a closer match to what is actually shown as burned in the photo, ended up looking too messy and lacked depth when scaling up. The cardboard came out the best, providing good depth and a burn that could scale up and have details that looked appropriate for the final piece. View the entire series of images. Over the last year or so, we’ve had the opportunity to work on automotive projects featuring everything from VW buses to SUVs to trucks. There hasn’t been a car we haven’t retouched or built from scratch in CGI. At least, that’s what we thought until California-based photographer Michael Sugrue approached us to work on a photo series featuring a Maserati. Michael is well known for his stunning portrait work, but he was interested in expanding his portfolio and building in more automotive work. 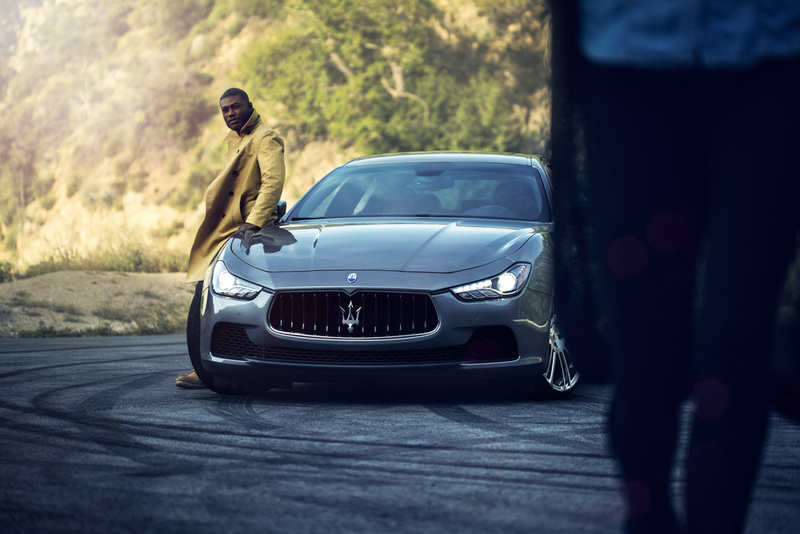 He previously worked with AG Luxury Wheels, a luxury wheel manufacturer that supplies tires and rims for Maserati, and he reached out to see if the company wished to collaborate on a series of promotional shots. Michael sought after a post-production team to work with on the series, and discovered the team at PXL.HOUSE from our prior automotive work. Michael especially liked how our work seamlessly integrated the car images with the environment, an important part of this particular shoot being that his backdrop was the breathtaking Angeles Crest Highway in California. Michael was aiming to leverage a small window of time--only a few hours long—which made it imperative that Michael stepped onto set prepared to capture the best photos possible in lightning-fast speed. We spoke with him beforehand guiding him on a few specific technical details, and we offered insight into what we’ve learned in our experience automotive post-production. That critical collaborative pre-planning step allowed Michael to maximize the mere few hours he had with the car and the talent to get the best photos possible. When the images transmitted to us, we were pleased with the quality and beauty Michael captured. Michael truly hustled to maximize the results that day. Hey, Michael – the feeling’s mutual. View the entire series of Maserati images. If you’re a photographer, and the New York Observer asks if you’d like to shoot portraits of Christopher Walken, you don’t even think twice about it. You just say YES. That’s exactly what happened to Long Island-based photographer Rick Wenner earlier this year. “When I got the email from the Director of Photography at the Observer asking if I’d like to work on the shoot,” Wenner recounted, “I almost dropped my phone.” Needless to say Wenner jumped at the opportunity, and we were thrilled that he chose PXL.HOUSE to join his team for this exciting project. Wenner discovered PXL.HOUSE when he came across a series of images we worked on for photographer Chris Crisman this spring. We had the exact style he was looking for in an integrated image post-production company, and he reached out with several different opportunities to collaborate. The quick-to-develop partnership led to us retouching the entire collection of photographs in the Walken series. The Observer tasked Wenner with creating a very dramatic portrait series of Walken that showcased the actor’s personality. During the hour-long shoot at Walken’s home in Wilton, Connecticut, Wenner snapped a variety of portraits of him in different settings. All of the interior shots were taken inside Walken’s guesthouse. It felt very much like a cabin tucked away in the woods, with an open layout and a beautiful mix of natural design elements and a grand stone fireplace. The exterior photographs were taken in his backyard, with the actor sitting on a moss-covered bench overlooking a natural pool. Walken was very laid back and relaxed during the entire shoot. There was a glimmer of that eccentric side of his personality we’ve all become accustomed to seeing in his work, but really, he was just a normal, nice and laid back guy. It was very important to Wenner that the style of the final photos looked and felt consistent with the rest of his portfolio. He wanted the portrait of Walken to have rich color and tone, with natural looking skin and subtle pops of color in the actor’s eyes and the background. Anthony Morrow, leader of the PXL.HOUSE team, took Wenner’s photographs and gave them a general onceover enhancing, bringing out those subtle details and carefully enriching the beauty that was already in each and every photo. There were short rounds of revisions and feedback between our team and Wenner, with most of the alterations being fine-tuning. We recently collaborated with photographer Chris Crisman and Guidemark Health on an ad campaign for Fluad (pronounced flooad), a multi-strain flu protection vaccine for men and women 65 years of age or older. The final series included six images - each photo featuring happy, healthy baby boomers being active and enjoying life. A few of the ads from the promotion even included an iconic Volkswagen bus…but more on that later! Gayle Macdonell, Brand Design Director for the Princeton, NJ-based agency, Guidemark Health, sought out a photographer to shoot the ad creative. She was familiar with Chris’s work and felt that he had the exact style the client was looking for on this particular promotion. Chris involved us in this campaign from the beginning, so we were able to get in on the ground floor of the project and really see his process from start to finish. We observed the way that he set up his shots, which helped us gain a greater understanding of his overall vision for the project. It also allowed for some real-time feedback. Chris provided a bit of direction on set for us to take with us to post-production, and we were able to jump in during the shoot to deliver some guidance, as well. The photo editing process involved some photo manipulation of both the environment and the background of the images. We also spent time carefully aging the VW bus that’s featured in a few of the photos from the campaign. The bus Chris photographed on set looked brand new. We needed to alter the bus to appear as though it had been painted back in the 70’s. Aging the paint to look as authentic as possible became one of our top priorities when manipulating the bus. Since Anthony Morrow, leader of the PXL.HOUSE team, is an illustrator and painter at heart, he actually hand painted all of the flowers, peace signs and details for the exterior of the van onto a large board. Once he finished his painting, he photographed his work, brought it into Photoshop and then blended the two images together. By maintaining the integrity and texture of actual brushstrokes, we were able to ensure that the final result looked extremely realistic. Communication was clear and open from the start to the finish of this project. The team at Guidemark Health felt very comfortable coming directly to us with feedback and questions, and Chris felt very comfortable letting that happen. Since we were all on the same page, this meant Chris didn’t need to be in the middle of all the post-production conversations. The entire collaboration – from the photo shoot with Chris to completing the campaign in post-production – took about two months. Chris, Gayle and entire the Guidemark Health team were wonderful to work with, and we look forward to future collaborations! Smoke screams out of the train like an adamant teakettle. A young girl stares in wonder. Who is she? Where is she going? And why are the colossal machine and the innocent child meeting here? We were thrilled to work on this promo piece with Philadelphia area-based, Chris Crisman Photography. What started off as one photo of a train taken at the Railroad Museum of Pennsylvania in Lancaster, transformed into a dreamy and compelling image that stands as a true testament to Chris’s vision and our close partnership on this project. Chris had a clear idea of where he was headed with this project, but he still needed to take a few more photographs for the composite piece to turn his vision into a reality. He worked with his team to hire a model, and then he set up a photo shoot. Chris sent us shots right from set, so we could drop the model into the train photo and provide instant feedback and direction while he was still shooting. This real-time approach allowed us to collaborate with Chris to find the perfect shot and determine the exact assets we needed to complement the original train image. This also helped to ensure that Chris and his team would get the shot they needed that day, instead of running the risk of setting up an additional photo shoot at a later date. The process of working on Chris’s composite was a team effort from start to finish. After two and a half weeks of conversations and rough mockups, we began working on finessing the actual image. Our first challenge with this piece was breathing life into the scene and starting to tell a story. We created movement by layering in a few billowing smoke images underneath the wheels and above the train, and painting the whirls and wisps of smoke to help evoke the sense that the train was pulling into this dream-like setting. Our next challenge was striking the delicate balance between the photo looking both ethereal and grounded. How do you make something feel otherworldly, yet totally believable? Constructing this look was a bit complicated, as we had to walk a fine line and make sure that the contrast, color and textural qualities were just right. Chris was a fantastic partner throughout the entire process. He visited the PXL.HOUSE studio for an editing session where he worked one-on-one with our team. This ensured our efforts were in line with his overall vision for the project. Not only was he open to our recommendations, he would also provide helpful feedback and guidance as we worked. Ultimately, the final product was composed of six images, not including the smoke effects. It took a little under two days of retouching on the image to complete. Creating composite photographs is truly the ultimate exercise in collaboration. While these types of projects always begin with a stellar image from the photographer, it is the alliance with our partners and clients that helps to produce the most striking and successful results. View a video of the final train image unfolding. Strong images produced for a major health care provider with photographer Robb Long. PXLHOUSE worked with Robb Long to create and refine a stylized look for his work on the Buffalo Wild Wings #FOOTBALLRICH campaign. We helped Robb strike a balance between his personal style and dynamic visuals that would fit the fun sports enthusiast campaign message. The campaign is designed to drive viewers to flaunt their football riches by taking a photo of themselves at Buffalo Wild Wings locations "living large during the whole football season.“ Head to a Buffalo Wild Wings near you, take a few fun photos and post them on Instagram with #FOOTBALLRICH. Maybe your photos will appear on the B-Dubs website! Congrats on this national campaign, Robb! PXL.HOUSE | All rights reserved to their respective artists.